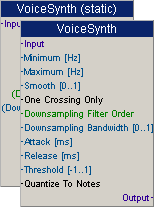 This page contains only DSP related SynthEdit modules (SEMs). The algorithms are tweaked to deliver the best performance as possible. This means that many parameters are not tweakable via pins. However, the important parameters can be, even if this sometimes means compromises in the performance. In this case the module is available twice. All modules that can be found here have been taken from my open source project ‘Delphi ASIO & VST’. Feel free to download the original source code and experiment with it. Despite being open source, the modules are currently not maintained any more. The files are packed using 7z. Visit the homepage to download a free tool to extract the archives. All modules that can be found below are bundled into one large SE module containing about 175 sub-modules. There are no examples included, but it can be useful for replacing several single modules by one large module as this module saves space due to common use of the code. It is updated less often then the other modules, but feel free to contact me if something is missing for your needs. Two audio file oscillators, that use any audiodata stored as WAV/AU/AIFF as an oscillator waveform. A very crazy idea to convert audio into an RGB value came into my mind, while working with the whole polyphase filter stuff. It’s far away from beeing sophisticated rocket science, but it is fun to play with this tools nevertheless. An example is included as well. A “Barberpole” flanger implementation with up to 16 stages (more on request). The crossfade algorithm isn’t perfect yet, but this creates an interesting pitchshift effect, so I left it in. Butterworth LP & HP filters (up to 64th order = 384dB/Oct). 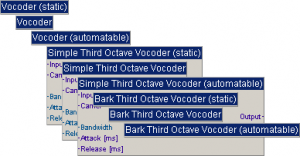 These filters are supposed to be used as static filters, but a special “automatable+” version is included as well, which allows to perform frequency modulations while maintaining a low CPU usage. The filter order may only be used statically though. Chebyshev LP & HP Filters(up to 32th order = 192dB/Oct). Chebyshev waveshaper tweaks up to 24 harmonics seperately. A simple chorus implementation with up to 16 stages (more on request). A Dither & Noiseshaper implementation with a fast gaussian dither and some unique noise shaping filters. The module is designed to run at 44100 Hz. The reason for this is, that the filters have to be recalculated for each sampling rate and I currently only did this for the 44.1 kHz case. If you consider using this module and you need other sampling rates as well, feel free to contact me. A convolution module for SynthEdit. Select a wave file with an impulse response, connect input and output and optionally choose the desired latency. The freely available code is entirely based on unoptimized open source code. It’s a bit slow, but free to use. A faster version using the Intel Performance Primitives is available. In the current version it is between up to 10x faster (if you allow some latency). That version can be licensed for 99,90€. A demo version is available here. This SE module contains 19 different dynamic processors (gates, limiters, compressors), that can be found in the Delphi ASIO & VST open source package. On request all these processors can be modified to support a sidechain input and more than one input/output channel for more complex settings. Lightweight Soft Knee Dynamics, based on some clever math tricks and psycho-acoustically optimized polynomes. Can be used for mono / stereo processing with a separate sidechain. Smooth lookahead limiter with peak stop. This module features a polyphase hilbert implementation that can be used to generate a good envelope. Simple Exciter class wrapped as SE module. Fibonacci binary sequence generator. You can adjust the order and additionally downsample the series to be able to use it as a unique waveform generator. You might also need to apply a lowpass filter in order to hear the low frequency details and to avoid damage to your speakers. The module contains 8 different types of biquad filters. 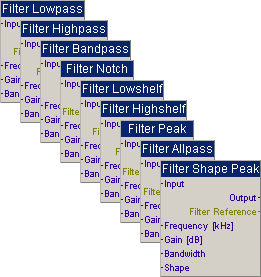 You can find all the standard filters (lowpass, highpass, bandpass, notch, allpass, low shelf, high shelf, peak) in here. Furthermore I added a filter featuring a universal shape control. This can change the filter type continously between lowcut, low shelf, peak, high shelf and high cut. It was part of my KVR Developer Chalenge entry of 2007. An implementation of a bode frequency shifter as SE module. Keep in mind that it’s not a pitch shifter. As the shift is linear (rather than logarithmic) the harmonics will loose their context and won’t be real harmonics anymore after the treatment. Integrated HRTF convolution module added. Use this module for binaural stereo positioning. The HRTF file used is public domain and was measured at the IRCAM. Other HRTF sets can be found on the project’s homepage. A Leslie implementation based on the mda one. Linkwitz-Riley crossover filter (up to 64th order). With this Pascal Script Interpreter you can use the Pascal language to create your own classes, procedures and functions and use them for DSP (might be slow though). Phaser Module, a simple phaser SE module with up to 16 stages. Similar to the chorus module, but the effect is completely different. 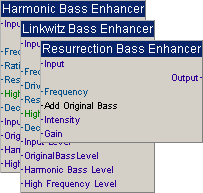 This reverb uses the convolution engine to create realistic reverb using convolution. It is meant as a public example for the convolution module. Reverb modules, based on STK reverb code, but modified to get access to some parameters (also fixed some bugs). Feel free to contact me for a stereo version of this module. A straight forward and ‘perfect’ ring modulator as SE module. This SE module encapsulates the SoundTouch library that can be used for high quality pitch shifting. 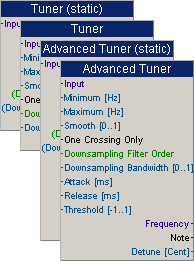 Some Tuner modules. They output the estimated frequency. The estimation is done by counting the zero crossings of a filtered signal. This is independent of the volume, but might not work with too strange harmonics. 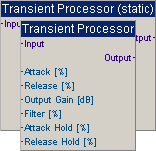 A transient processor based on the mdaTransient code, but modified and improved. Vibrato Module, a simple vibrato SE module. Similar to the chorus module, but with only one voice and no dry signal.